You are ready to find your perfect horse which undoubtedly will be a Thoroughbred. You may be wondering about how to navigate the process and all the options out there. Do you buy a horse from the track or a trainer? Would it be possible to adopt a Thoroughbred that would meet your needs? Where do you start your search and what are you likely to encounter on the way? Here at the Thoroughbred Adoption Network, we can help. We are starting a series of posts and webinars to help answer your questions and give you the information you need to make good decisions without wasting time or money. IS THIS THOROUGHBRED FOR ME? What are your goals? Trail riding? Alone? Hacking with company? Fox hunting? Showing? Eventing? At what level? How much time you will have to commit to an off-track thoroughbred and the training process? 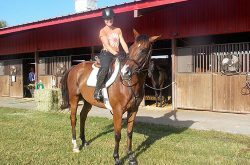 Do you need a horse that is completely trained and just needs to get used to you? Or, are okay with a diamond in the rough that will need training? Will you do the training or hire a trainer? Will you keep the horse at your home/farm or board him or her? Will you be the only rider? What is your experience level? How long have you been actively riding? What types of horses? Have you already ridden at the level you would like to achieve with your new horse? Do you have the money it will take to comfortably keep your horse, train your horse and deal with emergencies that may occur? Thoroughbreds really need company. They need other horses and do better with daily human interaction. Are you ready for that or have you planned for that? Shipping costs average $1.25-$2.00 a loaded mile. Do you have a shipper? Do you need our help to find a good shipper? Below is a link to a good article about general characteristics to look for and avoid. We’ll see you next week or anytime you want to browse the horses listed here for adoption. Or feel free to call or email us if you have questions.